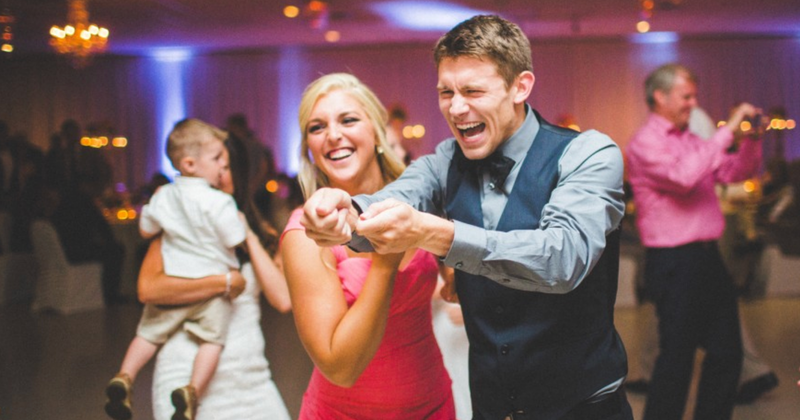 Your guests will love TLC, and they WILL dance! Fantastic musicians and great people! We have followed this band for years! They are great! Always a good time and great dance music! Really an amazing band! Total dancing all night. Great music..artist are friendly . .&..very talented . . They play a great variety of music! Taste like chicken brings such an amazing amount of energy to your special occasion. They are fun, professional and they are always my #1 pick when asked who I would recommend! They always get the crowd rockin’. And even non-dancers will be gyrating in their chairs. Great people and great music! So much fun to dance to. Love them! All the band members are SO HOT!! (and they’re fabulous) !!!!! Wonderful music and great rapport with the crowd; young and old alike! Great Talent and variety — Classy!! Wonderful dance music. Very talented group. they are awesome!! Lots of fun! They are truly amazing… Best band around. Great band always high energy and fabulous selection of music, follows the crowd and keeps the party going. They do an absolutely fantastic job. We see them every time they play freedom fest. They set the mood! good choice of music and very lively! We look forward to seeing these guys every time. Fun music! Always a great time. Awesome band and even more awesome group of people! The most professional band I have seen !!! They play music that we all love to hear. There is music from different era’s and genre’s. They are a very talented group of musicians. This band is the best around! 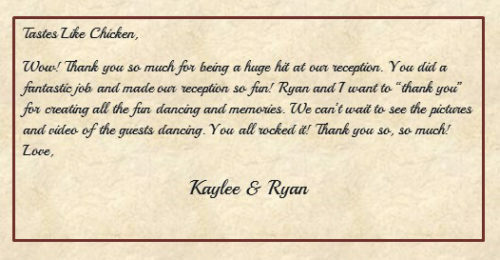 I have booked them for events for years, and was lucky enough to book them for my wedding last summer. My guests loved them as much as I do. They rocked it all night! This is a must see band! Greatest band I’ve heard in years. My son and his wife who own Matheson Heating and Air introduced me to this band. We have been enjoying them together for 10 years! Awesome!! I can’t stop dancing when they start playing! My family and I have enjoyed them for over ten years. We fall down dancing for them! Then get back up to dance some MORE!! Everyone one of them are great musicians and singers. Woo Hoo!! “chicken” is the foremost performance band, that is outstanding in each individuals contribution collectively. Great singers and musicians in a well-oiled and balanced machine that will keep yours toes tapping and your body movin’. We have followed this band for over 10 years! This is THE BEST band ever! Love the band members as well! I would highly recommend them to anyone for any occasion! They are amazing and fun! They Rock the house and play want you can dance to. Great band, love their upbeat sound. Be ready to kick off your shoes and dance the night away! Very fun band that can play any genre of music. Also professional and dependable! High energy — FUN emcee’ing — great band for those that want to DANCE, DANCE, DANCE & DANCE some more! Songs for all ages — oldies, top hits, and all the classics, too — FAB SINGERS — will have all of your guests dancing the entire night, and begging for more when it’s all over! Best variety of music and 100% LIVE.